In walleye country, it’s apparent that autumn is not far away. The days are still warm, but not as warm as they were 2 weeks ago, and, most noticeably, the nights are cooling down. Autumn means different things to different people, but for walleye chasers, it’s maybe our favorite time of the year to go fishing. The weather and scenery can be wonderful, you might have the lake to yourself, and, probably most importantly, walleyes go on the bite in the fall months. There are several techniques that will put fish in the boat, but if you just want to get bit, you can’t beat a jig. There might be better ways to catch bigger fish, but when it comes to catching numbers, jigs are the deal. And, don’t misunderstand, big walleyes will eat jigs. Here’s how you can get in on the action. Jigs come in a variety of shapes, sizes, and colors. In the fall, I would be very comfortable in most walleye situations with two different styles of jigs: I would want some Fire-ball jigs when minnows are being used, and I would want some Slurp! Jigs for those times when we’re using soft bait. Fire-ball Jigs have a short shank/wide gap hook. In many areas, redtail chubs are the preferred walleye bait, but fatheads will work also. We put the hook in the minnow’s mouth and out the back of its head. By doing so, we get outstanding hook-up percentages, and the minnow stays on the jig longer. The minnow’s lips are right up against the jig head. A three inch minnow is about as small as you’ll want to go. You can also tip a jig with plastic baits. Wherever walleyes live, anglers are learning that they will eat a jig tipped with some sort of plastic. I’ve caught lots of walleyes and some really nice ones on jigs and plastic from The Bay of Green Bay to the Dakotas and in a lot of places in between. Plastic offers advantages that live bait doesn’t. It comes in a variety of colors, it requires no special care to keep it alive or when transporting it, and it’s durable. The only thing it doesn’t do is wiggle on its own. The jig to be used for soft bait is important. That’s where the Slurp! Jig comes in. Slurp! Jigs have a large, long shank hook with a soft bait holder. We thread Impulse Paddle Shad or Swim’n Grubs onto the Slurp! Jigs. The large long hook results in a much better hooking percentage, and the soft bait holder keeps the bait on the jig much better. 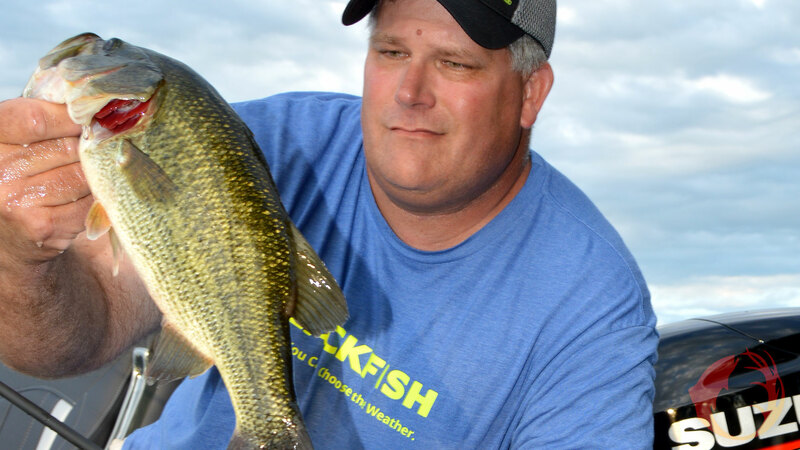 The more aggressive the walleyes are, the larger soft bait you should use. Mimic Minnows have also been a good jig/plastic walleye bait. Chad Peterson knows that walleyes and largemouth bass like to eat jigs at any time of the year. When using plastic, use a jig of one color with a body of another color. By doing so, you’re showing the fish two different colors, which increases the odds of showing the fish the color they want. Sometimes color matters. Six or eight pound test P-Line CX Premium is a great jigging line. If you want more hooksetting ability and sensitivity, tie about 20 inches of Tactical fluorocarbon to a mainline of 15 pound test XTCB Braid. The fluoro provides invisibility, the braid adds sensitivity and no-stretch. There is still some summer left, but fall is definitely in the air. When it arrives, tie a jig onto your line and head for a walleye lake. If you can find the walleyes, chances are good that you’ll catch’em.